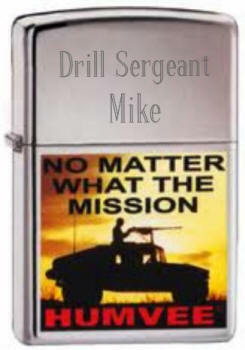 This High Polish Humvee Mission Zippo is decorated on the front with a picture of a Humvee and words that read 'NO MATTER WHAT THE MISSION' above the Humvee and 'HUMVEE' in red letters below. Zippo Lighters have signaled the start of some very special moments since 1932. This quality chrome Zippo lighter can be engraved to make a classic personalized gift for a loved one who may have been in the military.